Nicholas Wade’s A Troublesome Inheritance: Genes, Race and Human History was officially released today. Here at Occam’s Razor we previously discussed “How will the Cathedral deal with Nicholas Wade’s new book?” Let’s see. We’ll catalog the reviews here, adding them as they’re published. Andrew Sullivan quotes from Wade’s new book on reality of race. 28 Sherman: “Nicholas Wade Shows Why the System Needs Feminist Biology” And ThedenTV reprints it here. John Derbyshire, Jared Taylor and Richard Spencer discuss A Troublesome Inheritance and its responses. American Spectator editor (and rabid anti-evolution creationist) Tom Bethell criticizes Wade and defends Marxists Lewontin and Gould (yea, these frauds). What a joke. 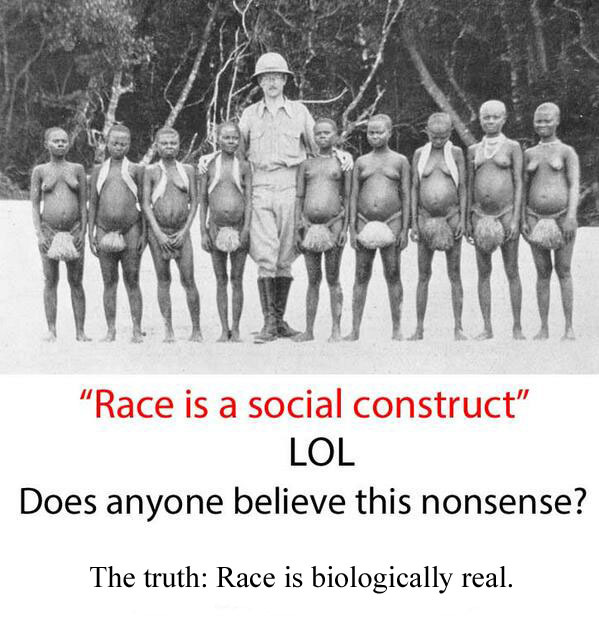 For creationists like Bethell, it’s all about “racism”. It’s noteworthy how religious creationists and liberal creationists seem to be motivated by the same things. John Derbyshire responds here. Pete Shanks tires to smear Wade by associating him with Stormfront and KKK. Shameful. More smearing from Pete Shanks here. PZ Myers admits race is real but then goes off on some tangent about “hbd really is just the slick new marketing term for modern racism“. Disappointing review, as it seems to imply that political correctness should trump scientific truth. Sailer responds here. Seth Shulman: “Book review: ‘A Troublesome Inheritance: Genes, Race and Human History,’ by Nicholas Wade” (At least the reviewer waits until the third sentence to bring up genocide. Between the lines: This reviewer suspects HBD is true but doesn’t think it should be discussed publicly. Sailer responds. Audacious Epigone responds. The Cathedral witch hunt is is growing too large to document in full, so here are some more New Creationist attacks on Nicholas Wade: Sam Wang here (Dienekes Pontikos responds); Chris Smith here (Unsilenced Science responds), here (Unsilenced Science responds), and here (Unsilenced Science responds); Jenn Raff here; Joe Graves here; Greg Laden here; John Terrell here; Dan Lende here; Philip Cohen here; Kenan Malik here; Alondra Oubré here (Unsilenced Science responds); etc. Over 100 scientists (witch hunters?) publish anti-Wade letter essentially denouncing speculative part of Wade’s book as speculative (Nicholas Wade responds; Henry Harpending responds; Geoffrey Miller responds; Ron Unz responds; Unsilenced Silence responds; Nicholas Wade responds again); etc. HBD Chick also offers some summaries here. A free PDF of Cochran and Harpending’s 10,000 Year Explosion (another very important book on recent human evolution). A list of articles on the reality of race. Nicholas Wade to appear on the Leonard Lopate show. Interview with Nicholas Wade at American Scientist. Nicholas Wade appears on CBC radio. The Daily Caller ran a story saying Nicholas Wade was fired over a Troublesome Inheritance. This story is false. (If it were true, it wouldn’t be surprising, as the USA now seems committed to anti-Darwinian liberal creationism.) Anyway, just heard from reliable source that Wade took a retirement package a couple of years ago. The deal was that he could continue to make occasional contributions on a fee basis. Info on NY Times buyouts is here. Charles Murray tweets corrective here and here. Nicholas Wade confirms here that he was not fired. Luke Ford interviews Nicholas Wade. Breitbart summarizes reviews of Wade. Rosemary Bennett discusses reviews of Wade. Henry Wolff on Nicholas Wade answering questions at Washington DC book signing. Robert Lindsay (liberal HBD blogger) argues that acknowledgement of HBD could still entail left-wing political prescriptions. Vox Day writes about pair-bonding discussed in Wade’s book. Bryce Laliberte interviews Nicholas Wade. Malcom Pollack discusses some of the reviews. Peter Frost comments on recent evolution. ThedenTV has a brief interview with Nicholas Wade. James Fulford comments on human biodiversity, Kennewick Man and fast evolution. Gregory Cochran posts on Lewontin’s Fallacy. Brian Bethune surveys Wade debate (but only quotes people opposed to Wade). Some “satire” of Wade and Dawkins, which tries to paint both as “racist”. Jared Taylor interviews Nicholas Wade. 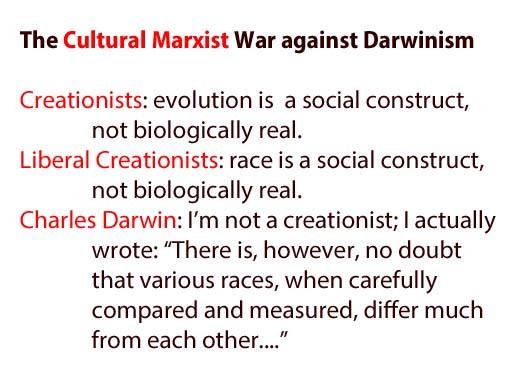 New Creationists: Those who profess to believe in Darwinism but deny biological reality of race and seem to think that human evolution for past 50k years has occurred only from the neck down. In other words, they believe in miracles. For more on New Creationism, see here. If you know of anything that should be added, please list it in the comments below and we’ll add it. N.B. We’re not including every blog post mentioning this book but focusing more on major reviews (in publications or blogs) about this book. My comment: This information, which includes relevant experimental evidence of biologically based cause and effect, can be compared to the importance of mutations and natural selection in Nicholas Wade’s book. It seems unlikely that all traceable cellular features of all organisms can be attributed to mutations and natural selection. However, they can readily be attributed to the epigenetic effects of nutrients and their metabolism to species-specific pheromones, which control the physiology of reproduction in species from microbes to man via conserved molecular mechanisms. Steadman’s review now in The New Republic. Comments open. Jayman’s comment is voted the best on the SPLC review. You need to follow the money. Look at Jon Marks and Allen Goodman. Both are rabid Cultural Marxists and rabid Zionists. And both are obsessed with trashing the goy Nicholas Wade. Yet, for their perspective, only the white goy is capable of racism. Both Marks and Goodman are completely silent on Israel recently sterilizing Africans and deporting African immigrants back to Africa. Why aren’t Marks & Goodman writing dozens of articles condemning Israel? Hmmm, makes you wonder what their true agenda is. You will find another commentary at SCIENCE DIALOGUES.COM. Why, Mr. Clark – you’ve attracted the attention of Uncommon Descent! Pingback: Gleichheit als soziales Konstrukt: Einstieg in Forschungen zu IQ, Rasse etc | PEGIDA Bayern?